Israel’s cuisine is heavily influenced by dairy, which plays a prominent role on most menus throughout the country. 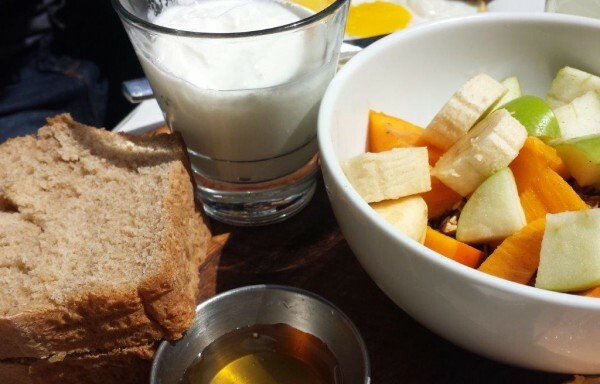 No Israeli breakfast is complete without cream cheese, cottage cheese or labneh; a strained yoghurt served with granola and fresh seasonal fruits. With a well established and highly competitive dairy industry, Israel is at the forefront of dairy farming in the world. With high tech systems to monitor the health of the cows, research into feed made from recycled vegetarian food by-products, and sophisticated water systems – despite the country’s lack of rain – this industry produces an extensive range of delicious, high quality cheese and dairy products. Israelis have become a nation of dairy eaters, to the point where they were prepared to demonstrate over the hike in price of cottage cheese by industry leaders Tnuva and the giant supermarket chains. Despite government intervention, they remained adversaries of the nation, due to the inflated prices of everyday foods. The upside to this price war was the increase in artisanal cheese making businesses across the country. 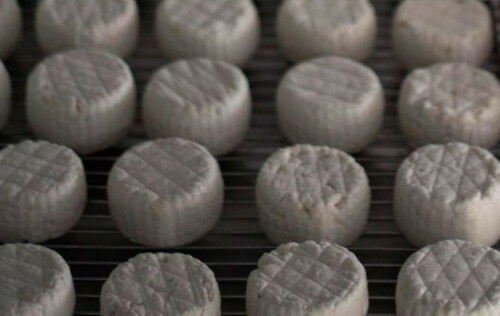 Producing an array of unusual cheeses using cow, sheep and goat’s milk, they can be found in the cheese shops of Tel Aviv, the farmers market in Shuk Ha’Namal on a Friday morning, as well as in the boutique dairies across the country, from the Upper and Lower Galilee to the Negev. Especially around the festival of Shavuot, where it is customary to eat, cook and bake with dairy, the recognised cheese shops in the culinary capital of Tel Aviv, as well as the individual sellers across the country, are stocking their shelves with a variety of cheeses and milk products for the occasion. 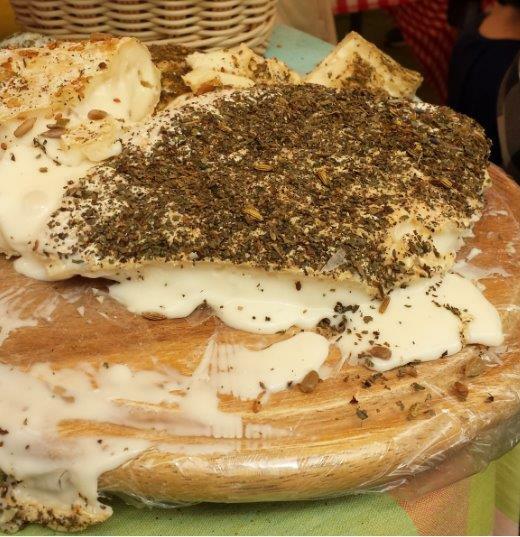 Both tried and tested cheeses, such as Tzfatit, a semi hard sheep’s cheese originating from Zefat, are selling fast, as well as new innovations, such as Camembert baked with herbes de Provence, a delightful, soft, creamy Camembert with the subtle aftertaste of dried mixed herbs, made by the family-run dairy Tzonel in Moshav Zippori. 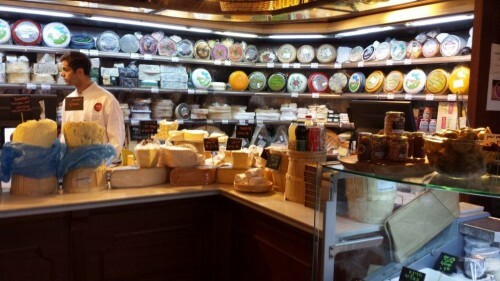 On one of Tel Aviv’s busiest streets, Ibn Gvirol, two of the most established cheese shops sit proudly displaying their specialty cheeses, in an ever increasing and competitive industry. Half way down is the famous Makolet Gvinot, where the reputable corner shop is full to the brim with handcrafted artisan Israeli cheeses together with imported cheese and wines from France, Italy and Switzerland. This fromagerie has staked its claim in the market for the past 12 years, having been run by the man who calls himself The Cheese Collector. 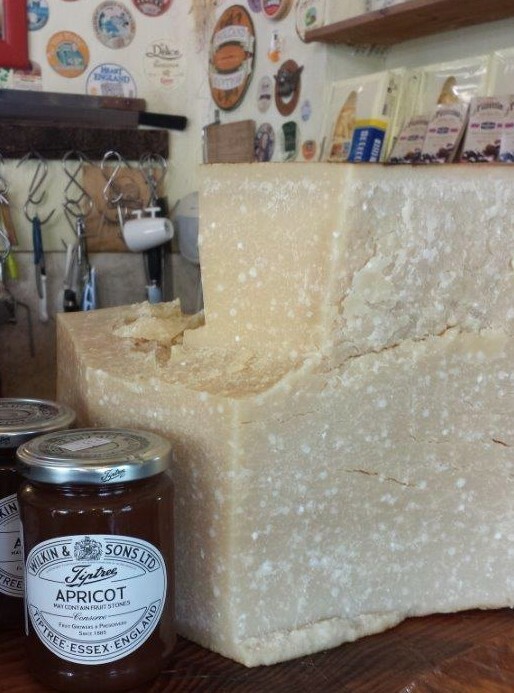 His uniqueness is down to the Parmigiana, the most aged in the Middle East, a hard, sheep’s cheese with a strong taste, a perfect addition to any fresh pasta, salad or on its own with bread and chutney. Further down the street on the other side of the road is the brown sign of The Gourmet Shop, owners of the 2015 bronze medal award for outstanding cheeses. The Gourmet Shop is exactly what it says it is, full of gastronomic delights including cured meats, olives, artichoke hearts, wines, and much, much more. Owned by Michel Raphael, a French sommelier who moved from Paris to Israel in 1995, the shop is located in the heart of Tel Aviv and sellsa diverse range of cow’s, sheep and goat’s French cheese and wine. The Gourmet Shop sells only kosher cheese, smokes its own salmon, cures its own meats and the specialty of the house is the foie gras. Raphael pairs all with wines chosen specifically from the wine regions of France and Italy, as well as boutique wineries around Israel. In this beautiful, 140 year old former German Templar colony, sits the unique and very contemporary Sarona Market. An indoor foodie’s haven, there is a little gem just inside the entrance of Sarona that will make you think you have just walked into a little Parisian fromagerie. Basher’s Fromagerie was brought to Tel Aviv from its origins in Machane Yehuda, by Eli Basher. For three generations, the Basher family served authentic Jerusalem dishes to the local community, until Eli turned his passion for French cheeses into a reality and the family restaurant became a fromagerie, a delight for the chef and locals alike. Every month, Eli makes his way to Rungis, the famous French wholesalers outside Paris, to replenish his stock of 1000 different cheeses sold in his shops in both Sarona and North Tel Aviv on Dizengoff, together with local wines, speciality breads and delicacies. You can also have Basher’s delightful cheeses made into sandwiches or salads and take away for breakfast, lunch, or simply to enjoy at your leisure. 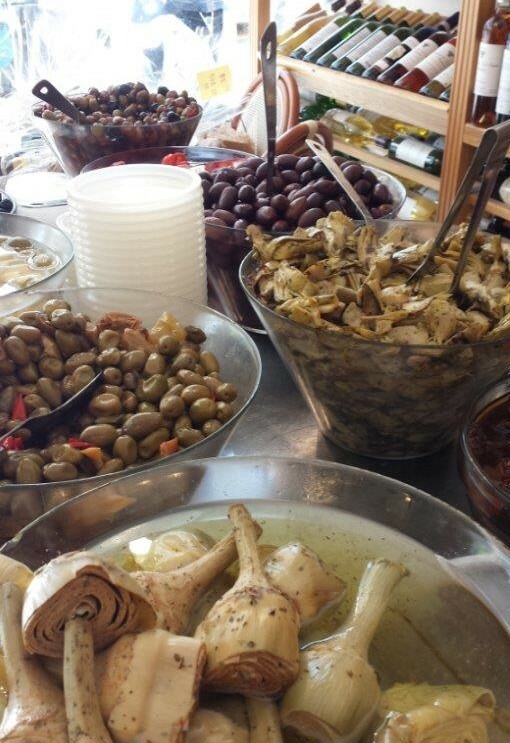 Tucked away in the midst of the bustling Shuk Levinsky is HaChalban, a cheese shop that has been importing cheeses, olives, cured meats and other delightful delicacies since 1958. 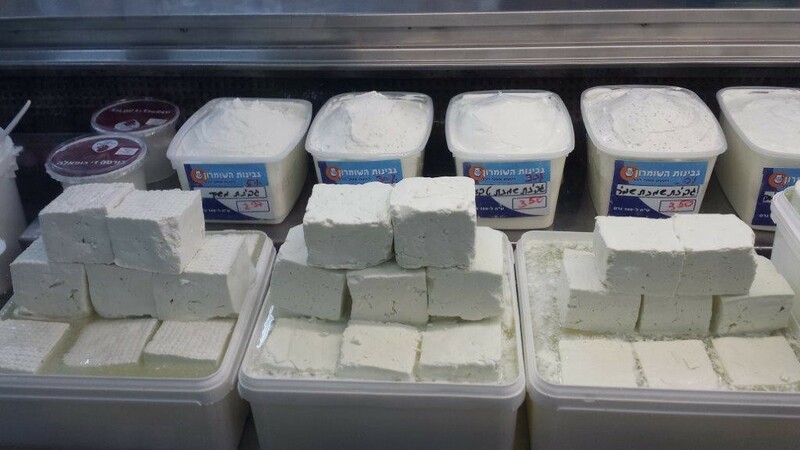 Importers of both hard and soft cheeses, it is renowned for selling salty Iraqi cheese, which is similar in both taste and consistency to feta, but if you drop it into hot water or fat, it becomes very elastic. It is a very versatile cheese that can be enjoyed as a snack or eaten in the hot summer with sweet, refreshing watermelon, or simply grilled with vegetables for a light lunch or supper. 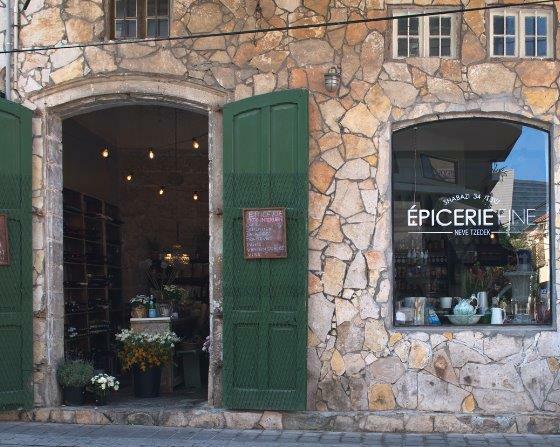 In the beautiful neighbourhood of Neve Tzedek, where the old architecture remains a feature of the modern boutique shops and cafés, Epicerie Fine is the only delicatessen on the bustling street of Shabazi. Walk through the green wooden doors of this quaint shop with tea rooms at the back and you will instantly smell the freshly baked loaves that sit in baskets, enticing you to see the cheeses, marinated olives, artichokes and antipasti that cover the counters. There are racks on the far left wall full of bottles of expertly chosen red and white wines that will accompany the tempting hard and soft cheeses on offer. This delicatessen is full of delights, pots of fresh herbs, jams and chutneys, sauces and chocolates all of excellent quality and a little haven for any cheese-loving foodie. With dairy produce playing such an important role within Israeli cuisine, it is not surprising that there are so many niche shops and delicatessens in the gastronomic capital, Tel Aviv selling such an array of fine cheeses, made from the small dairy farmers and artisanal cheese makers across the country. In the beautiful rural Judean hills, surrounded by the Ben Shemen forest, is Chai Farm where workshops take place, teaching the art of soft and hard cheese making, from the simplistic overview of how strained yoghurt turns into labneh, to the sophisticated methods of the semi hard Tzfatit first produced from sheep’s milk back in 1840. This farm is well worth a visit, not only to buy their delicious cheeses, olive oils and wines, but also if you are considering to try your hand at becoming a professional cheese maker. Many of Israel’s top chefs are adding a new dimension to their cuisine, both with innovative and contemporary flavours of not only the traditional cheeses from Europe, but also from the unique tastes coming from the small autonomous Israeli cheese artisans, elevating their menus to new heights, with creative savoury and sweet dishes, all using cheese.